Snap Frames : This snap frame is an enclosed bulletin board display! This framed bulletin board display is a component within our FORTE Series of display stands. This bulletin board display is an ideal cork board for any office, lobby, waiting-area, lounge or break-room environment. This bulletin board display, such as our enclosed bulletin board, can be used as a directory board in an office lobby or as a message area for college students looking for a ride home. You can even use it in a break-room to showcase employee performance levels or to communicate upcoming events. The enclosed bulletin board is a tamper-proof bulletin board display. 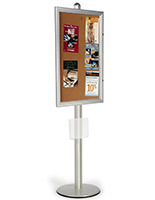 This directory board, bulletin board display, has a locking, metal frame to protect your materials. This is a worry-free way of exhibiting your announcements. We provide your cork bulletin board display with keys and a starter-set of pushpins. 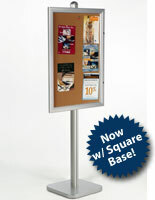 This 24"w x 36"h directory board, bulletin board display easily attaches to the 72" and 94" FORTE Series banner poles. 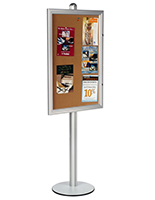 Use the grooves on these poles to adjust the height of your framed directory board. You can buy (2) bulletin board displays to make your fixture double-sided! The framed bulletin board display, also known as a cork board, is a great tool to help you communicate with your colleagues.